I first met Ms Aili Kuronen in September 2010, and then again a couple of weeks later, and again in November 2010. During the last two meetings I took a few videos on how Aili nalbinds. Aili learnt the art of nalbinding from her grandmother in Rautjärvi in the 1930's. Rautjärvi is a small municipality in South Carelia (Finland), about 70 km from Lappeenranta to the northeast, close to the Russian border. Grandmother taught Aili the Finnish Stitch 2+2, and later, in the beginning of 1950's, Aili learnt to nalbind the Russian Stitch 2+2+2 from her father-in-law, who himself had learnt nalbinding in his home in the Carelian Isthmus in the beginning of 20th century. (Carelian Isthmus belongs to Russia since 1940.) Aili's personal way of nalbinding both the Finnish Stitch 2+2 and the Russian Stitch 2+2+2 are different than what I had seen on magazines and books earlier. Aili Kuronen has been nalbinding for 70 years, and during that time she has learnt other nalbinding stitches, too. She has also been teaching on nalbinding courses, and doesn't want to take the skill of nalbinding with herself, as she says it, but wishes the information and the knowledge will spread out. In the first parts Aili makes the loops/stitches larger than usually, and she also works slowlier. In tha last parts (Finnish Stitch Part 3/3 and Russian Stitch Part 4/4) you can see Aili's own way of nalbinding. When you start with the second colour for the first time, hide the end of the yarn on the reverse side, and then do the change of colours like shown on the videos. I met another older nalbinder, who was originally from Joutseno, in September 2010. Joutseno is in South Carelia (Finland), nowadays a part of Lappeenranta, and next to the Russian border. I didn't happen to ask a permission to take videos on her nalbinding, so these videos show me doing thing how she did them. This woman, too, had learnt the art of nalbinding in the 1930's, in her home in Joutseno. First she had learnt to nalbind Finnish Stitch 2+3, and later the Russian Stitch 2+2+2 in what I call a butterfly technique. Also her personal way of nalbinding the Russian Stitch was new to me, and I had not seen it described in any book or magazine. I gave the name butterfly technique, because the loops sort of open up on the thumb and forefinger like wings of a butterfly. This nalbinder didn't have any special names for the stitches she knew, and she simply called them the "old way" (Finnish Stitch 2+3, which she had learnt first) and "new way" (Russian Stitch 2+2+2, which she learnt later), and she herself preferred the "new way" (Russian Stitch) was better for nalbound mittens. For joining a new lenght of yarn, she used plaiting/braiding, just like Aili Kuronen did. In this nalbinder's mittens both the mitten top and the thumb tip were very square-shaped. I met also this nalbinder in September 2010. She was originally from Savitaipale, which is a small municipality in South Carelia (Finland), about 40 km from Lappeenranta to northwest. This nalbinder, too, had learnt nalbinding in her home in the 1930's. At home she had learnt to nalbind with Finnish Stitch 1+3 (Brodén Stitch), and that was the only stitch she had ever used, but she knew there are other stitch types, too. Also she used to join a new lenght of yarn by plaiting/braiding, just like Aili did. I didn't take videos on her nalbinding, so these videos show me doing things like she did. I met this nalbinder in summer 2011. Her mother had taught her to nalbind when she was 7 or 8 years old, at the end of the 1930's. At home she had learnt to nalbind with Finnish Stitch 2+3 F2, and later, in mid 1940's, she had learnt from an acquaintance the Finnish Turning Stitch 2+2+tr F2. She preferred the Finnish Turning Stitch for mittens, because it gives a denser structure. In addition, she mentioned a variant her sister uses. In her sister's way, it is not the last loop which is 'turned' but the third, and her sister turns the loop by fingers (ie. Turning Stitch, variant II, like described in Leinonen's Master's Thesis). She didn't have special names for the stitches she knew. For making the first loops, at home she had learnt to twist yarn around the thumb. 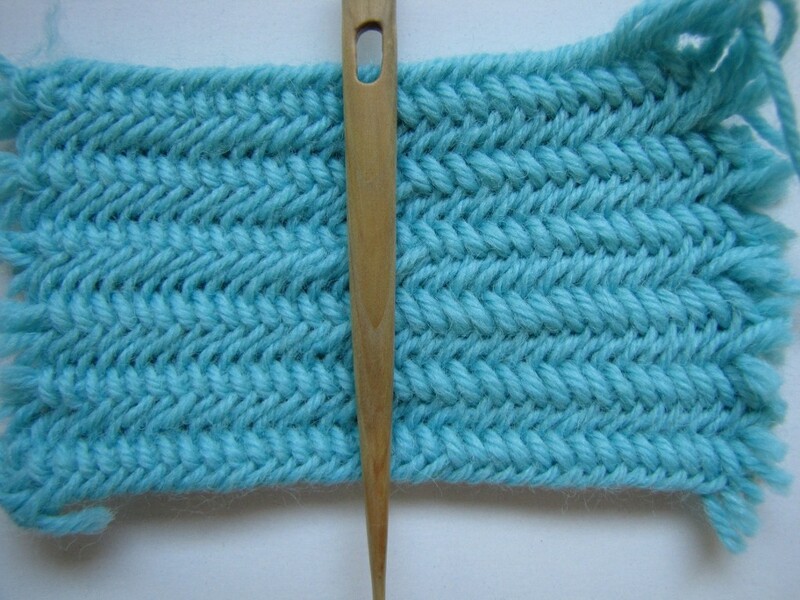 The bundle of loops is then lifted onto the tip of the thumb, and the needle is inserted in a way which makes the loops to form an 'eight' around the needle. The needle and yarn are pulled through, and a new thumb loop is formed. To get another thumb loop, all the six loops behind the thumb are picked up onto the needle, which is then pulled through, and a new thumb loop is formed. For the third thumb loop, repeat. The mittens this nalbinder had made were more clearly A-shaped than I had seen so far. Also the thumb was quite A-shaped. In the mittens she showed me, the thumbs had been started in the web side (upper edge of the opening). Turning Stitch "II" "2+tl+2" - - - Turning Stitch "II" "2+tr+2"